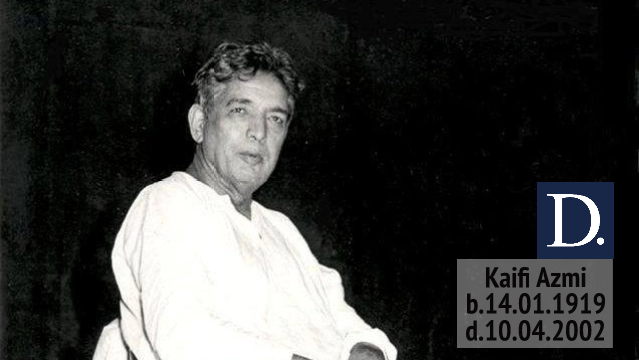 Born on 14 January 1919 as Sayyid Akhtar Hussein Rizvi into a Shia Muslim family of village Mizwaan in Azamgarh distrist of Uttar Pradesh, Kaifi Azmi is best remembered for bringing Urdu literature to the Indian motion pictures. Together with Pirzada Qasim, Jon Elia and others he participated in the most memorable mushairas of the twentieth century. Azmi was married to Shaukhat Azmi. They have a daughter, Shabana Azmi (An Indian Actress of film, television and theatre) and a son, Baba Azmi (Indian Cinematographer). Azmi’s daughter-in-law Tanvi Azmi(wife of Baba Azmi) is also famous TV actor. At age eleven, Azmi wrote his first ghazal Itna To Zindagi Mein Kisi Ki Khalal Pade and somehow managed to get himself invited to a mushaira and over there, he recited a ghazal, rather a couplet of the ghazal which was very much appreciated by the president of the mushaira, Mani Jaisi, but most of the people, including his father, thought he recited his elder brother’s ghazal. When his elder brother denied it, his father and his clerk decided to test his poetic talent. They gave him one of the lines of a couplet and asked him to write a ghazal in the same meter and rhyme. Azmi accepted the challenge and completed a ghazal. This particular ghazal was to become a rage in undivided India and it was immortalised as it was sung by legendary ghazal singer, Begum Akhtar. Azmi abandoned his studies of Persian and Urdu during the Quit India agitations in 1942 and shortly thereafter became a full-time Marxist when he accepted membership of the Communist Party of India in 1943. During this period, the leading progressive writers of Lucknow noticed him. They were very impressed by his leadership qualities. They also saw in him a budding poet and extended all possible encouragement towards him. Consequently, Azmi started to win great acclaim as a poet and became a member of Progressive Writers’ Movement of India. At the age of twenty-four, he started activities in the textile mill areas of Kanpur. As a full-time worker, he left his life of comfort, though he was the son of a zamindar. He was asked to shift his base to Bombay, work amongst the workers and start party work with a lot of zeal and enthusiasm and at the same time would attend mushairas in different parts of India. 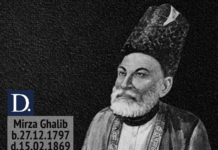 In Bombay, he joined Ali Sardar Jafri in writing for the party’s paper, Qaumi Jung. 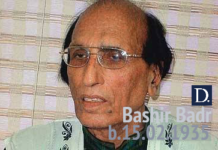 In 1947, he visited Hyderabad to participate in a mushaira. There he met, fell in love with and married a woman named Shaukat Azmi. She later became a renowned actress in theatre and films. They had two children together, Shabana Azmi (b. 1950), a renowned actress of Indian cinema and Baba Azmi, a noted cameraman. Like most of the Urdu poets, Azmi began as a ghazal writer, cramming his poetry with the repeated themes of love and romance in a style that was replete with clichés and metaphors. However, his association with the Progressive Writers’ Movement and Communist Party made him embark on the path of socially conscious poetry. In his poetry, he highlights the exploitation of the subaltern masses and through them he conveys a message of the creation of a just social order by dismantling the existing one. Yet, his poetry cannot be called plain propaganda. It has its own merits; intensity of emotions, in particular, and the spirit of sympathy and compassion towards the disadvantaged section of society, are the hallmark of his poetry. His poems are also notable for their rich imagery and in this respect, his contribution to Urdu poetry can hardly be overstated. Azmi’s first collection of poems, Jhankar was published in 1943. 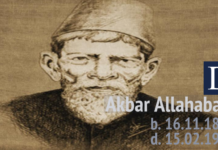 His important works including anthologies of poetry, were Aakhir-e-Shab, Sarmaya, Awaara Sajde, Kaifiyaat, Nai Gulistan, an anthology of articles he wrote for Urdu Blitz, Meri Awaaz Suno, a selection of his film lyrics, and the script of Heer Ranjha in Devanagari. Kaifi Azmi died on 10 May 2002.